If you are looking for a better alternative to Botox or Fillers, this is where you will find it. We can literally take take years off you in a matter of hours. In one Thermagie-CPT treatment, yes the pictures of before and after Thermagie-CPT are real. What's more unlike Botox of fillers you can not tell. There are no tell tail signs of a frozen face. There are no poisons, no injections. This is a virtually side effect free treatment. Does that sound great? yes it is. It's a treatment that both males and females take. After all who doesn't want to look younger. What is Thermagie-CPT Skin Tightening? Thermagie-CPT is a brand name for an advanced radio frequency skin treatment. It works under the skin to stimulate the body into producing collagen. It kind of tricks the body into producing collagen. 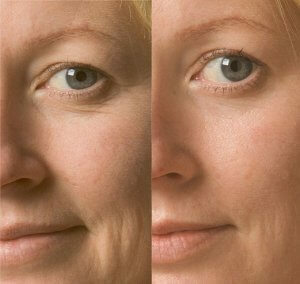 As we age the body produces less collagen, hence it is and anti-ageing treatment. Yes, our machine is a real Thermagie-CPT, rather than a copy. When you come to Xara Skin Clinic in Lane Cove. You can expect a free consultation from the person that will carry out the treatment. If we do not think you are suitable for the treatment because of an existing medical condition. we will tell you. It could be because you are pregnant or have an existing medical condition. Your safety is our highest priority you can discuss any skin concerns with us. We find most customers are suitable for the Thermagie-CPT skin tightening treatment. You can expect great day one results and results that keep coming for months. Your skin texture will improve, wrinkles will reduce and be removed. Your skin will become tighter and firmer. The elasticity will improve. You will want to show your friends the new me. See our non-surgical face lift facial to supper charge you Thermagie-CPT treatment. Talk to us today about starting your skin tightening Thermagie-CPT at the Australian laser skin care clinic in Sydney treatment today. For an all over whole body experience come and see us in Lane Cove on the North Shore. Come and relax in our opulent ambiance, welcoming staff, the scent of essential oils, calming music, the soft cool breeze. For world class, exclusive treatments and products, we are the beauty and skin care experts in Lane Cove on the North Shore. For an all over whole body experience come and see in Lane Cove on the North Shore. Come and visit us in Lane Cove, on the North Shore. Customers who require more than one treatment, ask us for a package price. We are one of the North Shore’s best secrets. Customers that can't find us, remember second floor Lane Cove, North Shore access via Birdwood Lane or watch this. Click Here.